Jordan Gusman has claimed back to back victories in the 16th Leonora Golden Gift Elite Mile in an impressive show of strength and endurance. Leading from start to finish the ACT athlete crossed the line in 4:11.83 ahead of James Hansen and James Nipperess was a league ahead of the rest of the field which included the cream of Australia’s middle distance runners. He said since missing Commonwealth Games selection earlier this year due to illness, he had a renewed focus to his training. “I have improved more in my mentality than anything else, just in the way that I attack races and go into races has changed a little bit and I think that was what was on display more so than anything else today,” Gusman said after the race. 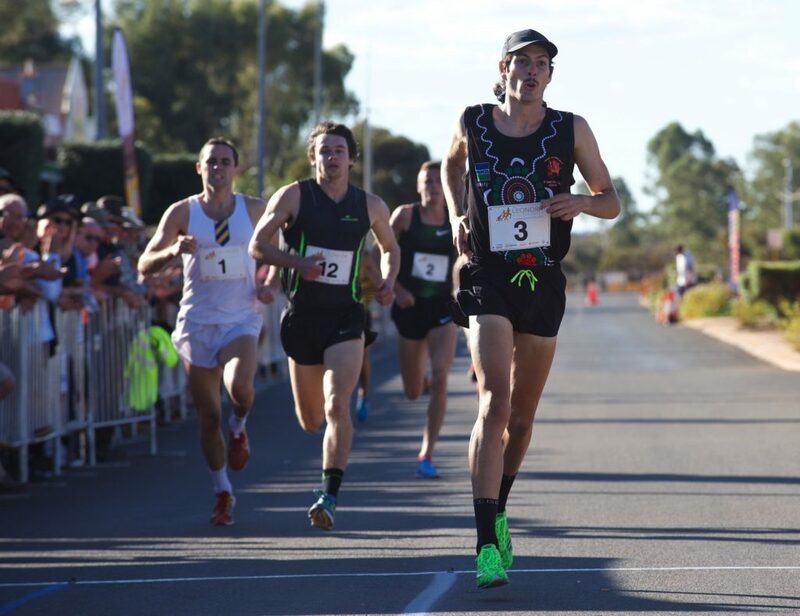 It was Gusman’s second win in Leonora, a town with which he feels a special connection, even racing in a singlet that had been given to him by a local. “I just love the community, they’re so supportive and it’s an experience unlike any other,” he said. “I can go to events in Barcelona and be put up in a 5-star hotel, but it’s nothing like staying in the miners village here and going out to the hoover house and the races. Leonora newcomer Chloe Tighe from New South Wales claimed the women’s elite mile with a blistering finish over last year’s winner Madeline Hills. Tighe came through in 4:39.90 ahead of Olympians Hills and Melissa Duncan. “For many years I have heard about the races in Leonora, and I’ve seen the results and I’ve followed girls like Madeline Hills and Melissa Duncan, but I’ve never quite been fit enough,” Tighe said after the race. Earlier in the day Lyndsay Troode and Jace Collingridge won the elite 600m titles and hometown hero and event parton Kiara Reddingius and WA’s fastest man Aaron Bresland claimed the 120m sprints. It was the seventh win for Reddingius and a fitting win off the back of a tumultuous season. Reddingius, who grew up in Leonora but now lives and trains in Perth, controversially missed out on Commonwealth Games selection for the Heptathlon in which she is ranked number two in Australia, but went on to win the inaugural $14,000 Bunbury Geographe Gift in April and prior to that the Parkdale Gift. It was an emotional day for Reddingius who later spoke passionately about supporting the kids of Leonora to set goals and follow opportunities. “To the kids, I’m so proud of all of you for running, especially in the 600m where noone walked,” she said, going on to thank the town for its support of her own athletic career and encouraging the local children to dream big.